The SD1 is a take on the Ibanez TS808 Tubescreamer but has a slightly different circuit components and a different clipping design. So let me introduce to you the act you’ve known for all these years – Sargent Dexter’s 808 parts Boss brand TS mod. The mod consists of restructuring the clipping section from asymmetrical clipping to symmetrical clipping and replacing the out of spec Boss components with 808 spec components. The stock, and noisier, JRC4558DD op amp is removed and thrown away and in it’s place an 8 pin socket has been installed. In the socket I slot a 4558D op amp and the auction includes a 4558P op amp as used on SRV’s Tubescreamers. You can swap op amps to the one you prefer by simply opening the pedal and removing the 4558D op amp and slotting the 4558P into the socket. The mod includes a Green LED and a brand new 9 volt battery. Switchable Clipping – $15: Add a switch to choose between Boss asymmetrical clipping and Ibanez symmetrical clipping. Gain Boost – $10: Doubles the amount of gain available and makes the pedal clean up better when drive is set low. Recorded with a Fender 62 Relic Strat middle pick up, Peavey Classic 50 tube amp on clean channel. 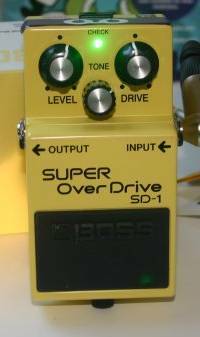 Take 1 Clean Fender then stock Boss SD-1 Super Distortion then 808 modded Boss SD-1 Super Distortion with JRC4558D chip. Take 2 Clean Fender then stock Boss SD-1 Super Distortion then 808 modded Boss SD-1 Super Distortion with TI4558P chip.